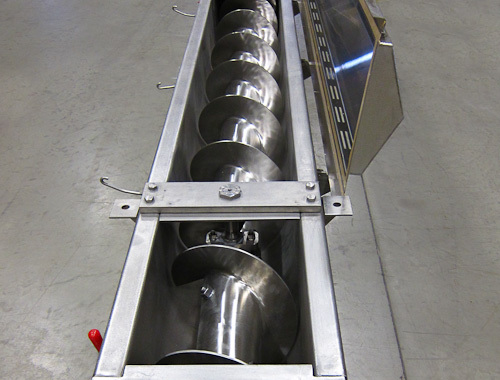 Flexible Screw Conveyors – Conveyor Engineering & Mfg. Co.
Vertical screw conveyors are often components in conveyor systems, attached to vats, bins, ovens, hoppers, silos and horizontal screw conveyors. They are most needed when material must be carried from a receptacle low to the ground to one that is very tall. Instead of inclined screw conveyors, which require a lot of room, vertical screw conveyors are space saving and allow both containers to be very close to one another. They are used in the food, chemical, mineral processing, wood products, wastewater treatment and agricultural industries to transport a wide variety of materials, usually raw, from one place to another. These include liquids, pastes, loose material, flakes, grain and powders. Because they often come in contact with edible material, vertical screw conveyors are usually made out of stainless or carbon steel, which are both sterile, non-contaminating, abrasion-resistant and have a smooth exterior. Since vertical screw conveyors usually handle substances that contain dust or vapor, they are always totally enclosed in tubing so they do not lose any material. The tubular metal housing contains the rotating screw shaft and has an inclined spout at the top, along with an inlet at the bottom, which may be offset to either side. Compared to their main alternatives, bucket elevators and pneumatic conveying systems, vertical screw conveyors are lower maintenance. They have the smallest dimensions, fewer spare parts and the best price to performance ratio. The bottom of a screw conveyor is composed of an inlet hopper into which the material is fed, a stuffing box, gear box, coupling and bearing housing. The material makes its way into the stuffing box and onto the rotating screw shaft, which carries it upwards to be discharged into a bin or silo. This is a very economical method of transporting loose material from one place to another, and it is used for many different applications that span a wide variety of industries. Vertical Screw Conveyors Vertical screw conveyors, sometimes called screw lifts, are material transportation systems that use a long, rotating helical screw inside a tubular casing. The screw rotates within a linear, upright path and elevates dry to semi-dry material that may be free flowing or sluggish. The central shaft has helical paddles in the shape of a screw, and when they rotate upwards, the material is carried along.